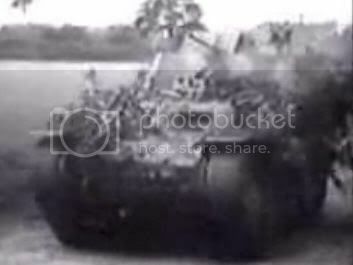 I have had it for quite a while but I can not identify the vehicle (primarily due to poor quality), does anyone have any idea? My guess its one of the Frenchtanks the Germans captured in 1940. If its took in Arnhem 44 it probably is one of those, out of my head it was 624 pz company or something like that. Isn't the drivers visor on the wrong side for that? They lost right of way when they come from right, because the driver on the tank couldnt see the bicycle coming , it caused some bad accidents. problem solved, thx for the input! Reminded me of an accident I saw once in Germany. A German guy with his mercedes somehow managed to get between two leopard tanks, despite the tanks drove in a column with blue flags and guided by military police.